A short somewhat steep trail leads from Blue Lake Road to Heart Lake. The trail continues around the lake following a powerline corridor over a low saddle to Thimbleberry Lake where it connects up with Thimbleberry Lake trail. Currently the connecting trail is poorly developed, though there are plans to upgrade it. In winter Blue Lake Road is closed to vehicle traffic, so it is necessary to walk a short distance up the road to reach the trailhead. The trail climbs up about 200 feet from the trailhead to the lake. 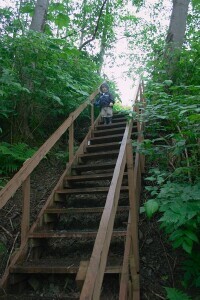 The steeper parts of the trail consist primarily of stairs. Parts of the trail between Heart Lake and Thimbleberry Lake may be difficult to follow. The trail to Heart Lake has been improved in recent years, but the trail between Heart Lake and Thimbleberry Lake is generally unmaintained. Drive out Sawmill Creek Boulevard to Blue Lake Road. A short distance up the road there is a small turn out on the left. There is not currently a sign, but the trail to Heart Lake starts here. Wildlife including bear, deer, toads, and a variety of birds can all be seen in the area.